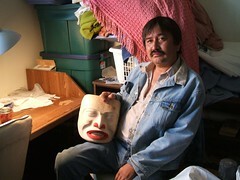 Some of the people I sat with were First Nations Canadian wood carvers and Inuit leather workers. In the United States, I learned how to blow glass along the cost of Oregon I visited ceramic studios and fine tapestry studios in Mexico. 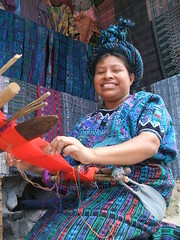 In Guatemala I spent months visiting women who hand-weave tradition Mayan fabrics using a back-strap loom. A back strap loom attaches to the waist by a strap; the artist kneels on the ground keeping constant pressure on the weaving in order to weave yarn though a forest of parallel threads. During the weaving process, symbolism seem to magically appear. These design and patterns can convey information about the weaver's village, marital status, culture or personal beliefs which often represent thousands of years of the Maya civilization. (More information on the women of Guatemala including the little downloadable book we wrote about them is here. A long time ago when I was in college, I worked part-time a gallery which sold art from all over the world. One of the art forms I loved and ended up owning was a mola. The mola originated in the San Blas islands off the coast of Panama. It is said that the Kuna women used to paint their bodies with geometrical designs, using available natural colors; in later years these same designs were woven in cotton, and later still, sewn using cloth bought from the European settlers of Panama. The women now decorate themselves from head to foot with colorful molas and jewelry. As a side note, the Kuna people use coconuts a form of money to trade and buy goods. If you ever visit one of the many tiny islands, do not e touch the coconuts because it belongs to someone and that would be like stealing money. In the middle of the high Andes mountains in Peru, I roamed around a neighborhood in Ayacucho called Santa Ana. This neighborhood high up the hills is well known as an artist district with over 250 families creating Peruvian art ranging famous high-quality tapestries, stone carvings and Peruvian ceramic religious arts. I visited 6 homes. 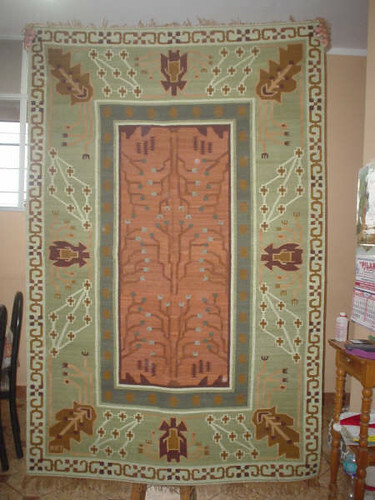 In the home of Hernan Bajalqui Tenorio, the whole extended family produces fine woven rugs from hand dyed threads. The rugs I saw ranged from 2'x3' to 5'x7'. The quality is top notch and much attention is paid to the the design, the weaving and the finishing details. I have been corresponding with Harnan on a regular basis. It is my intention to help him export this fine work. The cost is amazingly reasonable. If you are interested in purchasing any please contact me. 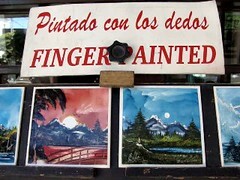 In Bariloche, Argentina, a very lovely tourist center, there were several organized art centers where artists could setup a booth and sell their art. It cost the artist three dollars a week for a permit to set up a booth. They hardly made enough to feed themselves but they somehow eke out a living selling to the tourists that stroll by. I tried selling my art work on the streets for 4 days and did not sell one. It was a humbling experience. While staying in Bariloche for a month, I met one artist, Dardo Rider Ortega who manages to support himself by creating and selling his hand painted tiles on the street in the main tourist street. He does wonderful Patagonia landscapes on ceramic tiles. He literally hand paints each one. He starts by smudging a little color on the tile, rubbing it around, adding more color, removing some of it, and three minutes later there are mystical landscapes depicting the mountains, lakes, trees, meadows and glaciers of southern Argentina. I filmed Dardo "Rider" Ortega creating his craft on the streets of Barloche, Argentina. He was also a great sales person that always took interest in everyone that stopped by his table. Take a look at the short video below. I told Rider and Harnan, I would try to find new markets for them when I returned home. As mentioned before if you are interested in purchasing any of the work featured here, please contact me.